Size 35mm for each of the 12 pentagon edges and 8cm diameter. The Pyraminx Crystal is a beautiful puzzle, actually two puzzles in one, hidden inside is a Megaminx with an outer layer creating the Pyraminx Crystal. We like to hereby express our sincere thanks to Aleh Hladzilin for his creativity and help in bringing the Pyraminx Chrystal into production. One quick word of advise The Chrystal is a puzzle for Advanced Puzzlers and needs to be handled with loving care especially during the breaking in period of around 1000 turns. Gently tap one of the 12 sides of the Crystal on a flat surface to fully align the pieces, (this can be done at anytime during puzzling) then holding half the puzzle gently in your left or right hand and then gently turn one slice with the other hand, never force a turn always gently reverse a turn slightly should it start to jam and then continue. For all you speed-cubist out there, you can fine tune the Crystal with a 2mm or 3mm cross head screw- driver as each screw head is visible inside the center of the 10 triangles on each of the 12 faces no caps need to be removed. The more even the tension on each face the better the puzzle will turn. 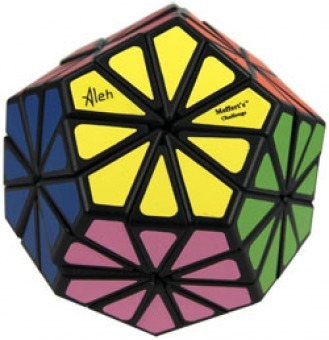 Please let us know your comments about the Pyraminx Crystal, we hope that you will just love it as much as we all do.